We’ve verified accuracy prior to press time, but these are small businesses that can be affected by everything from weather to the timing of a grandchild’s wedding. Call ahead. Pack a cooler to keep your purchases from wilting in a hot car. At farm stands and farmers’ markets, vendors are likely to close up shop when they run out. Go early to avoid disappointment, or call ahead to confirm availability. U-Pick Advice: Slather on sunscreen, bring insect repellent, and wear long-sleeved shirts and sturdy shoes or boots. Most U-picks will give you a bucket, basket, or bag, but it helps to bring your own. Typically, pets are not allowed, even at farmers’ markets. Bring cash for farm purchases; wine and beer tastings sometimes have a charge. THE TIME OF YEAR HAS COME TO dig up the dirt on harvest season. This time we’re starting from Pojoaque and pointing northward into the Río Grande Valley, then spurring west into O’Keeffe country, or up the High Road and over to the eastern front of the Sangre de Cristos. Along the way we’ll find no shortage of traditional regional products, of course—corn, beans, chiles, fruit— but also jumbo pink banana squash, scarlet queen turnips, red rubin basil, or green zebra tomatoes. We’ll visit farm stands, pick raspberries, stop to smell the lavender. This is the season for connecting with New Mexico’s deep agrarian roots, supporting our farmers and ranchers, and showing the kids that carrots—especially of the cosmic purple variety—do not originate in a plastic bag. 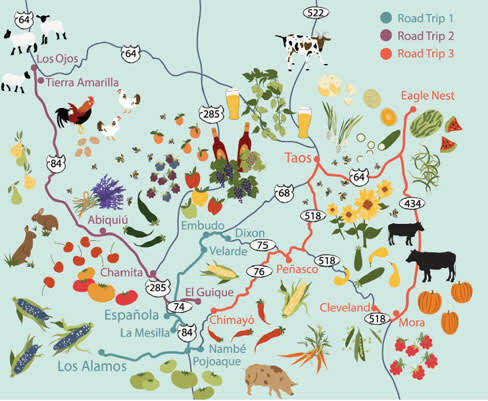 North-central New Mexico supports numerous farmers’ markets, and they tend to be small celebratory affairs where you can easily park, and growers have time to talk with you about how and where they farm. Since many of the farms that hug the Río Grande corridor don’t have extra staff to welcome guests, or on-site stands where you buy their produce, the markets are one of the best ways to get an overview of our agricultural bounty and the hardy souls who produce it. You’ll also find quite a few wineries listed on these road trips. These businesses grow at least some of their own grapes on-site for “estate bottlings,” or buy other New Mexico grapes for their winemaking. We even give a few cheers to microbreweries that use local ingredients, and one distillery. Interspersed, you’ll find some farm-style lodgings, so you can extend your Trip to Bountiful. The Río Grande and its tributaries give life to the small farms and orchards that dot northern river valleys like freckles on a fair-haired eight-year-old. A trip up through agricultural villages like Velarde and Dixon is a step back in time to sustainable family farming; in fact, Dixon has the largest concentration of organic farmers in the state. Climb to the heights of Los Alamos to find a distillery and a most engaging farmers’ market. Estrella del Norte Vineyard and Casitas Richard and Eileen Reinders’ estate is a gem of a place to spend a weekend afternoon. They make some two-dozen wines, from grapes as different as mour-vèdre and Riesling. Check out the distinctive Geronimo’s Gold, made from their apples. This dessert wine has a smooth apple flavor with a robust, port-style finish. The winery has a great array of special events. On September 14, Chef-owner Matt Yohalem, of Santa Fe’s Il Piatto, will present an Italian harvest dinner in the vineyard. Reserve soon. The Santa Fe School of Cooking hosts occasional classes here ($85–$145; 505-983-4511; santafeschoolofcooking.com), featuring food from the wood-burning grill and details on New Mexico wine history. The owners of the winery have two quaint casitas that can be rented for a wine-country experience: one at the winery property, the other at the nearby Nambé Valley vineyard. Vivác Winery The Padberg family owns and operates this little gem, now celebrating its 10th anniversary. The adobe tasting room, surrounded by vines and flowers, sits at the intersection of N.M. 68 with N.M. 75. The winery has an estate-bottled red blend, and numerous other wines in styles from sweet to full-bodied dry. One that I’ve enjoyed over several vintages is the Dolcetto, a light-bodied dry red with a somewhat smoky finish that’s friendly to a broad range of foods. Visitors can try pre-set tasting tours of selected wines or create their own tasting à la carte. Wine flights showcasing three wines with either a savory plate or house-made chocolate truffles are also available. The Tower at El Bosque Farm This singular accommodation puts you in the midst of a quiet working farm in the Embudo River valley. The lower, river-stone part of the structure originally served as a writing studio for owner and author Stanley Crawford. After adding on to their own home, Stan and his vivacious wife, RoseMary, expanded the studio into a guesthouse, with a downstairs bedroom, upstairs sleeping loft with futon, and balcony. The views of fertile fields and nighttime stars are worth more than the price of the whole stay. La Chiripada Winery and Vineyard A chiripada is “a stroke of luck,” and owners Michael and Patrick Johnson feel the name is apt—they’ve made a living in the wine business for some 30 years now. Their signature wines, Special Reserve Riesling, Río Embudo Red, and Río Embudo Red Reserve Selection, are made from grapes grown at their vineyard in the Río Embudo Valley. Warm summer days and cool, clear nights combine with rich, sandy loam to create ideal conditions for the cultivation of grapes, but the winters at 6,100 feet made the Johnsons choose cultivars capable of withstanding cold and a short growing season. Other wines, including viognier and Shiraz, are made here from grapes grown elsewhere in New Mexico. A charming spot. Open daily. Dixon Cooperative Market This village institution, really the heartbeat of the community, is open daily to sell produce, condiments, and meats from many area growers and producers. For instance, you can’t get fresher beef than from JR Ranch, in nearby Lyden, owned by Joe and Betty Romero. Their Black Angus Vaquero Beef is also USDA-inspected and -certified Natural: no hormones or antibiotics, and the cattle spend their time between the ranch and the lush meadows above Peñasco and Truchas. 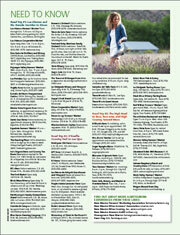 This is the first of three foodie-friendly roadtrips appearing in the Sept. 2013 edition of New Mexico Magazine. One road trip a week will be posted on the website, or, you can purchase the magazine today to see all three now.